Have you ever been in a situation where you’ve felt taken advantage of and you walk away grumbling at a person because of the interaction? Are you a grudge holder? Do you struggle with having a voice with someone and expressing your needs and concerns with them because you fear an uncomfortable moment? 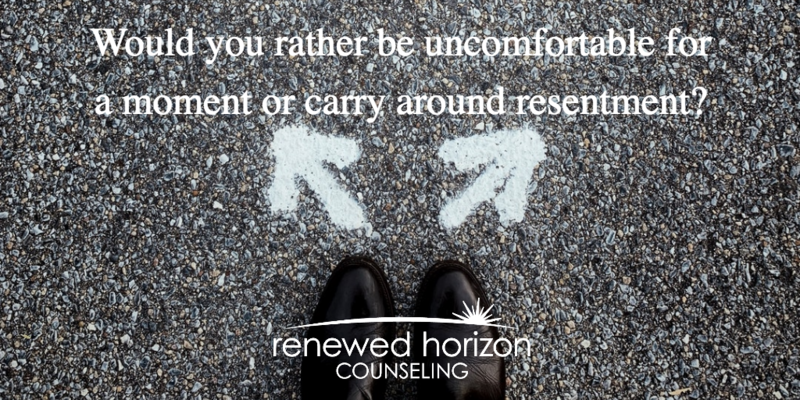 If you answered yes to any of the above questions, you may need to take Brené Brown’s advice to be uncomfortable more than resentful. Think about it, the few seconds of being uncomfortable with someone by speaking out is much better than the minutes, hours, days, and weeks that resentment can overwhelm you. Resentment causes people to have anxiety, lose sleep, miss out on events in order to avoid people, and ultimately it causes unforgiveness that is an intense burden to carry throughout life. This is unhealthy for you physically, emotionally, and spiritually. You can’t have a healthy relationship without boundaries. Yes, it’s uncomfortable to speak up and say ‘no’, but doing this keeps you balanced and from being mistreated or taken advantage of by others. Boundaries teach others about who you are, what you value, and what you need from them. Choosing discomfort over resentment helps you to be vulnerable with others. We aren’t clones of each other which means we will be different, feel differently, and need different things in life. When we live to people please in order to avoid an uncomfortable moment with someone, we’ve prevented them from truly knowing our uniqueness. We often fear that if we are vulnerable enough to be known that we will be rejected and left unloved. Leaning into the discomfort of having a voice is a way to know if a relationship is a safe one that you should continue to invest in. When people avoid discomfort and end up resentful, they struggle with being honest with others. Their fear of rocking the boat causes them to restrain their voice and go with the flow. Sometimes they have buried it so deeply they aren’t even sure how they feel, so they aren’t honest with others and themselves about what they feel and need. Avoiding the uncomfortable moment might end with you being dishonest in order to just move on and avoid conflict and discomfort. A temporary moment of discomfort is much better than dragging around resentment and being upset about a situation for a long period of time. If you’ve ever held on to a grudge for a long time, you know the weight I’m talking about. It brings anxiety, anger, depression etc. Of course the moment of addressing an issue in the moment is uncomfortable, but it’s better to choose discomfort over resentment any day. Are you an avoider of uncomfortable moments in relationships? If so, do you struggle with resentment? It might be time to choose a healthier path of discomfort over resentment.